It’s got a slip knot just tied around it so when you put tension, when this is stretched, it comes loose. So if a fish got caught on there it would pull that loose, that weight, and [the halibut] was free to roam around—pull or whatever, and that didn’t get hung up on anything. Then at low tide you would go back and get that rock and keep using it over and over again. 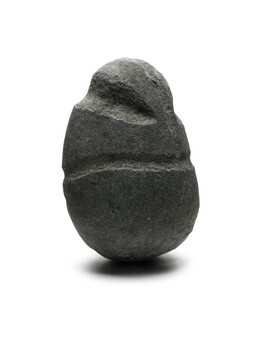 A grooved stone sinker weighted down a wooden halibut hook so that it floated just above the ocean bottom. When fishing from a beach, the fisherman used a rising tide to float the hook; he tied on the stone weight with a slip knot so that it would come off when a halibut was on the line. At low tide he went back to retrieve the weight. Bobby Stamp: You’d find them probably this big, . . . five inches. . . . And they got a round . . . notch in it like this. Well, what I was told that, see, they were using kelp [for line to attach a sinker to a hook]. . . . They would set that with a halibut hook on it. See, on that rock, see here’s the end of the line here. . . . They tied that rock [sinker] with a slip knot on it. That hook is floating from the bottom and that rock is here [below it]. Laurie Mulcahy: So this is like a weight? Bobby Stamp: Yes, that’s just to hold it there. And it’s got a slip knot just tied around, so when you put tension, when this is stretched, it comes loose. So if a fish got caught on there, it pulled that loose [from the rock] weight. And it was free to roam around, pull or whatever, and that didn’t get hung up on anything. Then at low tide they go back and get that rock and keep using it over and over again.
. . . At high tide, when they caught a fish or halibut, they just pulled it in. I’ve seen halibut pulled in, big halibut.